how much protein do you need to reduce hunger for weight loss? 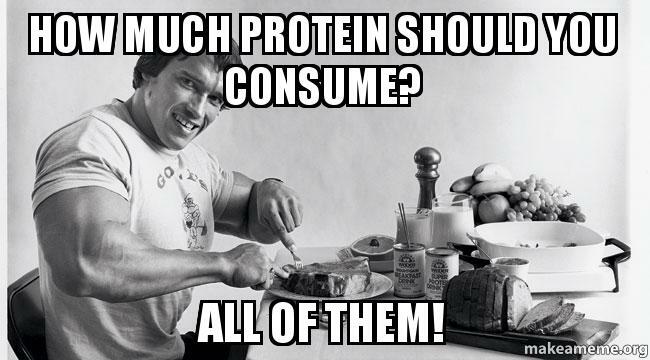 There is a lot of discussion, confusion and misinformation around the interwebs around the topic of protein. Will ‘too much protein’ raise my blood sugars? Will ‘too much protein” ‘kick me out of ketosis’? Won’t ‘too much protein’ hurt my kidneys? Won’t protein raise mTOR and give me cancer? Isn’t protein is a poor energy source? But I don’t want to be a bodybuilder! We recently stumbled across a massive dataset on ResearchGate of more than half a million days or two million meals worth of anonymised MyFitnessPal Food Diary from nearly ten thousand people logging their food for more than two months. I was intrigued to see what we can we learn about the protein intake of people who succeeded in eating less compared to the people who struggled to meet their goal. 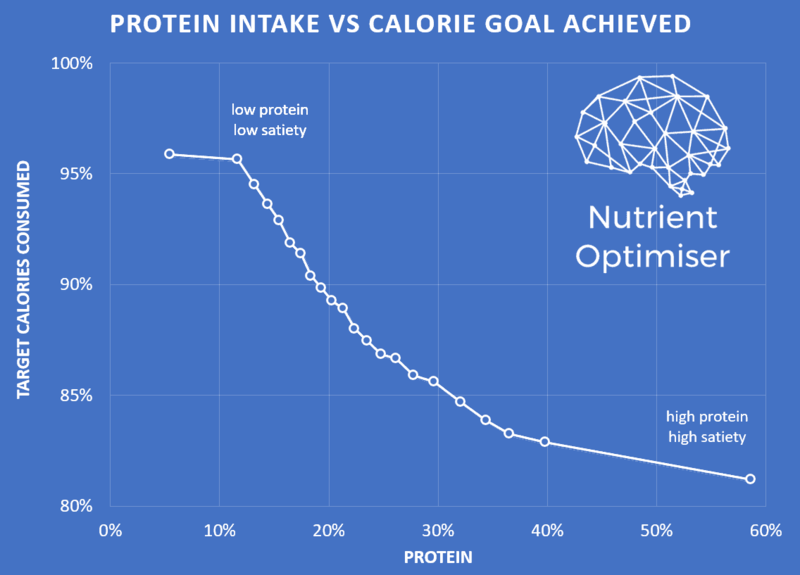 The chart below shows % energy from protein vs how much they ate compared to their goal intake. Greater than 100% means that they failed to meet their target. Less than 100% means that they were able to consume even less than their goal. While there is a lot of scatter, we can see that people who consume higher % protein tend to spontaneously eat less, while those who consumed less protein tended to eat more and were less likely to achieve their goal. We can remove some of the noise in this plot by breaking the data into 20 groups and looking at the average. This next chart shows the % protein versus the % target intake on average for each of the 20 groups of people. Each of these dots represents the average of 25,000 days of food logging. While there are some extremes, most people tend to get between 12% and 35% of their energy from protein. What does this look like in terms of lean body mass? Assuming most people are aiming for a calorie intake about 15% below their Basal Metabolic Rate (BMR), we can estimate their lean body mass using the Katch McArdle formula. From this, we can then estimate their lean body mass (LBM) and convert the chart into protein in terms of g/kg LBM as shown below. A protein intake of around 0.7g/kg LBM (around the Daily Recommended Intake) appears to correspond with minimum satiety while a higher protein intake reduces hunger which will enable you to effortlessly consume less food and lose weight. Increasing your protein intake from 0.7 to 2.4g/kg LBM appears to correspond to a spontaneous calorie reduction of approximately 15%. When we consider the fact that protein does not yield as much energy due to the thermic effect of food, we end up with a spontaneous energy deficit of more than 20% simply by prioritising protein! Unfortunately, discussions on protein targets often get muddled in a mess of units. So I thought it would be useful to demonstrate what the minimum and maximum protein amounts look like using different units. The table below shows what 0.7g/kg LBM (which provides minimum levels of satiety) looks like in terms of a number of different units for a lean and an obese man (consuming 2000 calories) and woman (consuming 1600 calories). Meanwhile, the table below shows the protein intake that corresponds to the highest satiety protein intake of 2.4 g/kg LBM. My preference is to talk about protein in terms of g/kg LBM because it relates to the amount of metabolically active muscle mass. However, body weight is simpler because you don’t need to think about how much body fat you have. Meanwhile, ideal body weight suits some because they have an idea of what weight they would like to be. If your goal is increased satiety, fat loss and decreased hunger then you will want to move towards the higher levels of protein. In the first instance, you can just try to make sure you hit a minimum protein intake each day based on your weight and body fat. This will help kerb the cravings and manage your overall intake. As you become leaner you may need to dial in your overall energy intake by focusing on leaner protein sources to ensure you get the protein you need without excess energy. If you require therapeutic ketosis to manage epilepsy, Alzheimer’s or Parkinson’s then the Nutrient Optimiser algorithm will calculator your macros using a minimum of 0.8 g/kg LBM. However, most people who are interested in nutrition are looking for fat loss and/or diabetes management (and not therapeutic ketosis), hence we set the minimum protein intake at 1.8 g/kg LBM. Dietary approaches with lower protein than this ‘minimum effective dose’ tend to have a poor nutrient density. A protein intake of 1.8g/kg LBM corresponds to the level beyond which we don’t appear to get any further gains in muscle growth. However, we do appear to get additional benefit in satiety and nutrient density. Many people get confused with the numbers and units, which is why we created the Nutrient Optimiser. to calculate your ideal macronutrient range as well as provide you with some suggested foods and meals that will help you reach your goals. If you are still concerned about ‘too much protein’ I have outlined some brief responses to the common concerns noted at the start of this article. Too much protein will raise my blood sugars! People that produce adequate insulin in their pancreas (i.e. not Type 1 diabetic) tend to see a fairly stable blood sugar response to protein. Some people even experience a drop in blood sugar, so start slowly and titrate up to a more ideal protein intake. While a low carb high-fat diet will mask the symptoms of diabetes by stabilising blood sugar and reducing your HbA1c, it is the reduction of fat stored around your organs that will ultimately reverse your diabetes! Too much protein will ‘kick me out of ketosis’! Ketosis occurs when there is less carbohydrates and proteins to provide oxaloacetate in the Krebs cycle, so we revert to ketosis to burn fat for energy. If you need to lose weight then more protein will likely drive an energy deficit, which will cause higher ketone levels as you consume your body fat for fuel. However, keep in mind that BHB ketones are mainly a transport or storage form of energy and do not correspond with effective use of fat for fuel. While ketones have experienced a surge in popularity thanks in part to people who would like to sell you some, ketones are far from the most important health marker. If you are more concerned about elevating your blood ketone levels than the fat that is being stored in your liver, pancreas, heart, eyes and brain and driving you towards the most common diseases of our western civilisation, then may I politely suggest that you should review your priorities? This video, while very graphic (you have been warned! ), demonstrates why fat loss is not just for bodybuilders, but critical for health and longevity. Too much protein will hurt my kidneys! Will protein raise mTOR and give me cancer? We need a balance between building up (mTOR and anabolism) and breaking down (fasting and autophagy). What we do know for sure in all this is that excess energy (regardless of the source) seems to be one of the biggest contributors to diabetes, cancer and other metabolic diseases that accelerate ageing. Optimising your diet with adequate protein to improve satiety and reduce body fat levels to ensure you are physically robust and independent for as long as possible sound like a much safer bet than crossing your fingers hoping that protein restriction (which only seems to work on worms in a Petri dish) will extend your life. Protein is a poor source of energy! Yes, fat is an efficient fuel source compared to protein. But if you have excessive stored body fat then getting more fuel is not your highest priority. Your body is highly motivated to ensure you consume adequate protein to prevent loss of lean muscle. Getting adequate fuel is secondary. Eating lower protein foods means that, in the pursuit of adequate protein, you will need to consume more fuel (i.e. carbs and/or fat) than your body can use. Conversely, eating higher protein foods reduces appetite. With adequate protein locked in to build and repair muscle (and enable other vital functions), your body will be happy to get the fuel it needs from your excess stored body fat. The spontaneous reduction in appetite that we see from the analysis of the half a million days of MyfitnessPal data demonstrates that your body is much more willing to burn your unwanted body fat if it is getting the protein it needs. Forcing your body to convert some protein to glucose for energy (a.k.a. gluconeogenesis) is not such a bad thing. If you always give your body some fat or carbs when you need energy it will never need to dip into your body fat stores. The ‘good news’ here is that it takes a lot of intentional effort (and often some extra chemical or hormonal assistance) to build massive muscles. Optimising your protein intake will only enable you to manage your hunger, lose body fat and reverse your diabetes. Our bodies seem to be happy with less energy when we provide it with adequate protein. Low protein intakes correspond with the lowest levels of satiety and the highest energy intake. Higher protein intakes tend to increase satiety and spontaneously reduce hunger. Increasing protein from 0.7 g/kg LBM to 2.4 g/kg LBM corresponds to a to spontaneous calorie reduction of approximately 15%, even before we account for the higher thermic effect of protein. Thanks so much for reading! In the next article in this series, we’ll look at what the data can tell us about the relative satiety provided by fat, carbs, sugar and fibre. You might be surprised by the findings! So make sure you subscribe to ensure you receive it! How do u calculate body fat percentage? Looking at one of your charts, PSMF, what does that stand for? Protein Satiatey My Fit? This is brilliant. I love your writing style because it is easy to understand and you get straight to the point without confusing the reader. Keep it coming Marty!!! Wow! Thanks Rachel. Great to know the practice and polishing is paying off! I just wanted to express my gratitude for all the amazing work you do! Truly thankful, you’ve helped me tremendously both in my own nutrition practice and in improving the practice of the people I work with. Once again, your work is changing many lives, thank you! Thank you for the great articles. I’m a bit confused about the focus on BMR. I’m active and want to begin weight training to add about 10-12 lbs of lean muscle. How do you determine how much protein, carbs and fat to satisfy the additional energy requirement above BMR and to provide protein for muscle growth? Yeah. This article is mainly about fat loss. Muscle growth is about providing enough energy to build muscle but not so much you gain fat. I have a future article in the pipeline for that. You realize that most fad diets like Keto or low carb generally calorie restrict? So those on those eating low carb will clearly also be eating less? Causation correlation issue here. Yeah, but everyone here is trying to calorie restrict. The analysis shows us what helps people succeed and fail.